ALBERT NOBBS. The Oscars have come and gone, leaving the unrequited nominees to walk away, heads held as high as possible. The fervor surrounding The Artist (not undeserved) drowned out the competition, leaving masterpieces like Albert Nobbs in the dust. 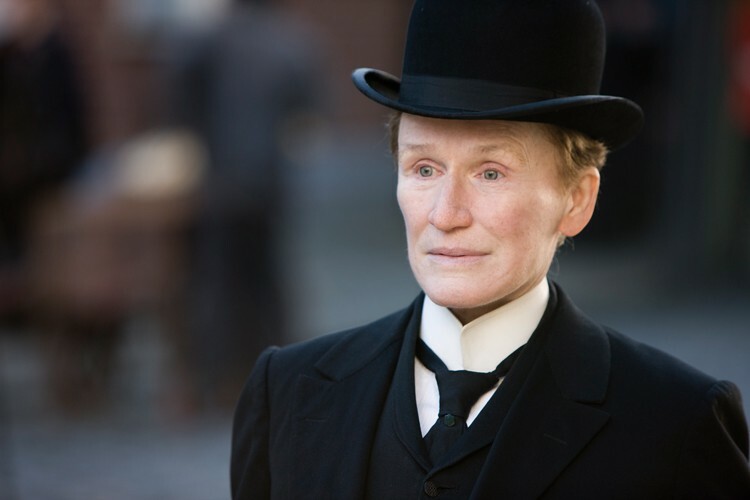 The story centers on Glenn Close's title character, an Irish woman living as a man in 19th century Dublin. Dishonesty, a central theme, is strewn across the lives of the supporting characters. Each is striving to be something he or she is not, leaving a true self mired in the shame and embarrassment of failure. Uplifting, right? Nobbs serves as a waiter and butler in a prestigious hotel, constantly at the service of richer people living worse lies. Disguised as a man, even in private, Nobbs imagines a better life for herself, knowing it can be achieved only through the success afforded to men. Meanwhile, hidden affairs, illegitimate pregnancies, abuse and shame run amok with the supporting characters. The notable supporting cast includes Mia Wasikowska (Alice in Wonderland), Brendan Gleeson and Janet McTeer. Nobbs' naïveté creates a perfect lens through which to view the lives of her coworkers and superiors, as she sees so much and understands so little. The understanding is left for the audience. Despite the constant disappointment of nearly every character in the film, the story manages to be more inspiring than depressing. Subtlety and economy are the core ingredients. George Moore's original short story (adapted for the screen by Close and others) doesn't drown you in each character's misery but rather teases you with hints and glimpses, masterfully evoking empathy. R. 113m. Ends Thursday at the Minor. WANDERLUST. I'm still waiting for Paul Rudd to lose his charm and allow the next thirty-something charmer to come into power. Though his acting capabilities may be vast (and undiscovered), he seems to know the value of the niche he occupies. Comedy needs the awkward straight man to play off the insanity he is surrounded by. Watching a crazy man become crazier is not nearly as funny as watching a sane man go crazy. No stranger to comedy formula, Wanderlust clings to Rudd's inherent, handsome oafishness. Once again, the investment in Rudd pays off. The storyline is your typical, quirky situation in which people are thrust into an unfamiliar setting and flail around hilariously until they realize it's the place they've always wanted to be. George (Rudd) and Linda (Jennifer Anniston) bite off more mortgage than they can chew and are forced to retreat to George's brother's place in Atlanta. On the way there, they stay overnight at a hippy compound turned B&B, where the flailing begins. The characters and their absurd interactions make the film worth seeing. This seems to be the forte of director/co-writer David Wain (Stella, Wet Hot American Summer). He takes normally predictable situations and disguises them with ridiculous dialogue and awkward interactions, walking a fine line between flinching discomfort and pants-peeing hilarity. Surrounded by skewed stereotypes (the nudist, the drug-addled and aged hippie, the feminist hippie chicks, etc. ), George and Linda immerse themselves in exaggerated, Woodstockian culture until something finally breaks. A couple of ancillary performances quickly become grating (particularly Reno 911's Kerri Kenney), but they are mostly drowned out by the calmer antics of Rudd. It's a well-balanced combination, ensuring Rudd's place in his cozy niche. R. 98m. At the Broadway, Mill Creek and Fortuna. ACT OF VALOR. Is it fair to put Act of Valor under the same scrutinizing lens as other films? Every genre requires its own perspective, but how exactly does one critique a propaganda film (poorly) disguised as an action movie? As the risk of sounding like a bleeding heart, Act of Valor goes beyond paying homage the U.S. military; it works desperately and cloyingly to convince its audience of the threat of impending terrorism and the value of protection. If this statement makes me seem paranoid, then I urge you to sit through the film, all 111 propagandizing minutes. Much attention has been paid to the cast of actual, active-duty Navy Seals. Though acting is not generally the most important part of action movies, it does tend to elevate movies above campy dreck. Realism, on the other hand, has to be appropriate to the genre and plot. In a drama or historical film, realism makes the plot more believable; in a film about terrorist attacks on American soil, pushing realism to the extreme for the sake of box office numbers comes across as crass and unnecessary. Glorification and realism can't coexist without creating persuasion and promotion. The film makes brief and tedious efforts to incorporate storylines outside of the military angle, but the inexperience of the cast makes these moments seem forced and patronizing. Which, really, is no different from the rest of the film. R. 111m. At the Broadway, Mill Creek and Fortuna. THE LORAX. This "Tree-D" adaptation of Dr. Seuss' classic environmental cautionary tale features eye-popping animation from the creators of Despicable Me and vocal work from Danny DeVito, Ed Helms, Taylor Swift and Betty White. PG. 94m. In 3D and 2D at the Broadway and Mill Creek, 3D only at the Fortuna. PROJECT X. Every generation needs its own out-of-control-high-school-party movie, right? This one looks to inject the formula with the raunch of The Hangover, whose director (Todd Phillips) produces here. R. 88m. At the Broadway, Minor, Mill Creek and Fortuna. Next week, College of the Redwoods and Humboldt State University will present the 14th annual International Latino Film Festival. Each film in the three-night fest will be preceded by an introductory lecture in both Spanish and English and will be followed by a panel discussion. (Students get class credits, but everyone is invited.) This year's lineup features a trifecta of Cuban films, starting Tuesday, March 6, with (appropriately enough) Viva Cuba (2005), a tale of childhood friendship with shades of Romeo and Juliet. Wednesday's feature is La Vida Es Silbar (Life is to Whistle), a 1998 feature that examines the lives and beliefs of three residents of Havana. The festival comes to a close Thursday night with Fresa y Chocolate (Strawberry and Chocolate, 1993), about a cultivated gay man's infatuation with a hetero young communist. Each evening's events begin at 6 p.m. Admission for non-students is $6. The Arcata Theatre Lounge's next family-friendly Sunday feature will be Don Bluth's 1988 baby dinosaur cartoon The Land Before Time. G. 69m. 6 p.m. If you loved The Artist and/or Hugo then you should head to the ATL's Sci-Fi Pint and Pizza Night next Wednesday for an evening of silent era films including Georges Méliès groundbreaking 1902 classic A Trip to the Moon (featured prominently in Hugo). The second picture of the evening will be Der Golum, a silent 1915 film inspired by the ancient Jewish legend. 6-10 p.m. THE ARTIST. Mostly silent, black-and-white homage to cinema's mostly silent, black-and-white early years, nominated for 10 Academy Awards. PG13. 103m. At the Minor and Mill Creek. THE DESCENDANTS. George Clooney plays a Hawaiian parent and land baron thrust into real life after his wife's jet-boating accident. R. 115m. At the Minor. GHOST RIDER: SPIRIT OF VENGEANCE. Nicolas Cage stars in this moronic, action-packed sequel centered on Johnny Blaze, a motorcycle-driving stuntman who sold his soul to the devil. PG13. 95m. In 3D and 2D at the Broadway and Mill Creek, 3D only at the Fortuna. GONE. Bug-eyed beauty Amanda Seyfried sets out to save her sister from the serial killer who abducted her two years ago. PG13. 94m. At the Broadway and Mill Creek. GOOD DEEDS. Hollywood outsider Tyler Perry writes, directs and stars as Wesley Deeds, a wealthy businessman jolted out of his First World ennui when he meets a cleaning lady in his building. PG13. 111m. At the Broadway. JOURNEY 2: THE MYSTERIOUS ISLAND 3D. Dwayne "The Rock" Johnson leads a family-friendly adventure to the isle of 3D effects. Jules Verne barfs in his grave. In 3D and 2D at the Broadway and Mill Creek, 3D only at the Fortuna. SAFE HOUSE. An otherwise generic CIA thriller gets a lift from Denzel Washington's charisma. R. 115m. At the Broadway and Mill Creek. THE SECRET WORLD OF ARRIETTY. From Japan's Studio Ghibli comes a whimsical adaptation of The Borrowers. This simple, animated tale of Lilliputian scavengers offers timeless delights. G. 94m. At the Broadway. STAR WARS: EPISODE I - THE PHANTOM MENACE. Have your childhood memories re-befouled, in 3D. PG. 140m. At the Broadway. THE VOW. After a car accident, a woman loses all memory of her husband, so he has to woo her anew. PG13. 104m. At the Broadway.